Orphan. Conman. Felon. Prisoner. Messiah. Malcolm X emerged from a life of crime, reborn under the gospel of the Nation of Islam and its leader, Elijah Muhammad. But as Malcolm came to national attention as the face and voice of "Black Nationalism" in the late 1950s, rifts began to form in the organization, and soon Malcolm would be in danger... not from outside forces, but from men within his own brotherhood. Upstart - Hurry to Upstart.com/NATIONS to find out how low your Upstart rate is! Checking your rate only takes 2 minutes—and won’t affect your credit! John Wilkes Booth was a nationally-renowned star actor, but his most memorable performance at Ford's Theater in D.C. would take place in the presidential box. On April 14, 1865, when the Civil War was all but officially over, Booth and his co-conspirators set in motion a last-ditch plan to destabilize the Union government.Sponsors!Upstart - Hurry to Upstart.com/NATIONS to find out HOW LOW your Upstart rate is. Checking your rate only takes 2 minutes—and won’t affect your credit! Famed actor John Wilkes Booth was rehearsing with a touring company in St. Louis, when he pointed a prop pistol at his castmate and said, "If you were President Abraham Lincoln, what a chance I'd have." He may have been joking at the time, but two years later in 1865, Booth's chance finally arrived. Parcasters - Need some more true crime history? Check out this weeks episode of Serial killers on the ruthless Cleveland Torso Murderer. As the sun began to set in Guyana on November 18, 1978, five bodies laid dead on the Port Kaituma airstrip. But the real carnage was still to come. By nightfall, over 900 people would be dead at the Peoples Temple’s Jonestown compound.Sponsors!Robinhood - Robinhood is giving listeners of Assassinations a FREE stock like Apple, Ford, or Sprint to help you build your portfolio. Sign up at Nations.Robinhood.com.Upstart - Hurry to Upstart.com/NATIONS to find out HOW LOW your Upstart rate is. Checking your rate only takes 2 minutes and won’t affect your credit! Prince Felix Yusupov's perfectly-laid plans to kill Rasputin didn't go as smoothly as he'd hoped. By the time the affair was over in 1916, Rasputin was poisoned, beaten, shot and drowned.The Bolshevik Revolution had officially begun. Sponsors!Upstart - Hurry to Upstart.com/NATIONS to find out HOW LOW your Upstart rate is. Checking your rate only takes 2 minutes—and won’t affect your credit! On February 21st, 1965, multiple shooters opened fire at the Audubon Ballroom in New York City. Within half an hour, Malcolm X was pronounced dead and Talmadge Hayer was in police custody. However, in the coming days, investigators were met with more questions than answers.Parcasters - If you found yourself fascinated by this story of an American icon, check out our our new episode on John McCain on HOSTAGE, wherever you get your shows. Listen now at parcast.com/hostageSponsors!Robinhood - Robinhood is giving listeners of Assassinations a FREE stock like Apple, Ford, or Sprint to help you build your portfolio. Sign up at Nations.Robinhood.com. Orphan. Conman. Felon. Prisoner. Messiah. Malcolm X emerged from a life of crime, reborn under the gospel of the Nation of Islam and its leader, Elijah Muhammad. But as Malcolm came to national attention as the face and voice of "Black Nationalism" in the late 1950s, rifts began to form in the organization, and soon Malcolm would be in danger... not from outside forces, but from men within his own brotherhood.Sponsors!Upstart - Hurry to Upstart.com/NATIONS to find out how low your Upstart rate is! Checking your rate only takes 2 minutes—and won’t affect your credit! In 1949, Egypt was on the brink. The rapidly growing Muslim Brotherhood had struck out against the government in opposition to the actions of King Farouk I. Farouk, a young and inexperienced King of Egypt. As the violence increased, and both sides prepared for war, one man would pay the price: Hassan al-Banna.Parcasters - Be sure to check out Bill’s new show Extraterrestrial! Listen at parcast.com/extraterrestrial! In the last years of his reign, this Emperor was known for his frequent and extreme executions. When his mistress discovers her name on his list of people who should be killed, she takes matters into her own hands. This marks the beginning of the end of the Roman Empire.Sponsors!Upstart - So Hurry to Upstart dot com slash NATIONS to find out HOW LOW your Upstart rate is! Checking your rate only takes 2 minutes—and won’t affect your credit! Known as one of the most egotistical Roman emperors, Commodus famously commissioned statues depicting himself as the mythical hero Hercules. He regularly fought as a gladiator, and claimed to be the son of Jupiter. Ultimately his megalomania would be his downfall, when in 192, a conspiracy formed by his mistress and the praetorian prefect went into action.Parcast News - Be sure to check out Parcast’s first fictional crime show MIND’S EYE at Parcast.com/MindsEye! Environmentalists are accustomed to large corporations villainizing them. From the 1970s to the early 2000s, Sister Dorothy was no exception, turning the wealthiest landowners in Brazil against her. She was prepared to pay the ultimate sacrifice in order to be a catalyst for change. Known as the “Angel of the Amazon” she dedicated her life to protecting the poor in the 1970s to early 2000s. In order to lure multinational corporations, Brazil would bribe officials to acquire land, obtain false titles, and evict settlers. Dorothy Mae Stang was a fierce opponent to these unethical practices, and worked tirelessly to protect small-scale farmers during a time of upheaval in Brazil.Sponsors!Audible - Listen to “Evil Has A Name” only on Audible. 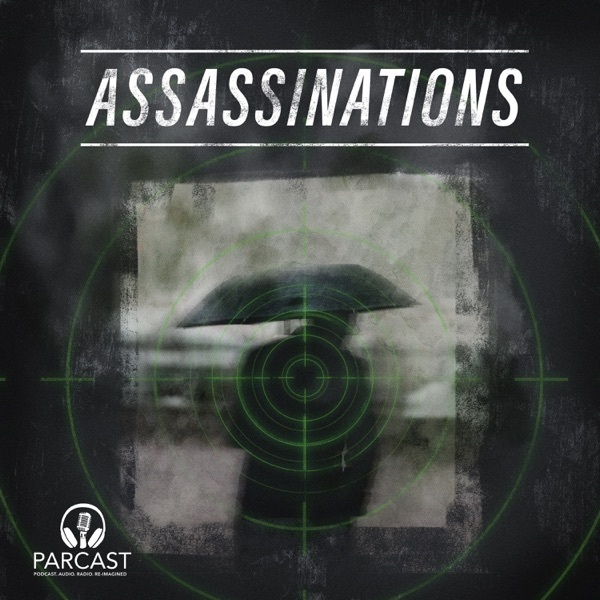 Listen now at Audible.com/EvilAssassinations.Sun Basket - Go to SunBasket.com/ASSASSINATIONS today to learn more and get $35 off your first order! As a beacon of progressive hope among the desperate people of Brazil, Marielle Franco made it her life’s mission to help the impoverished and fight police corruption. She was elected councilor in 2017 in a country where political power isn’t always feasible for black, queer politicians. Franco’s supporters believe that her murder was politically motivated, and her killers have yet to be identified.Parcast Network - Check out our new show Hostage at https://www.parcast.com/hostage. News of Selena’s death shocked her beloved fanbase, and the nation. During Yolanda Saldivar’s sensational trial, her attorneys claimed that she had meant to kill herself but the gun misfired in Selena’s direction. If Selena’s life hadn’t ended so suddenly, the world of music would be vastly different today. Thank you for listening to our new show! If you liked this episode, leave us a nice review, it really helps new listeners find the podcast.Sponsors!Sun Basket - Go to SunBasket.com/ASSASSINATIONS today to learn more and get $35 off your first order!